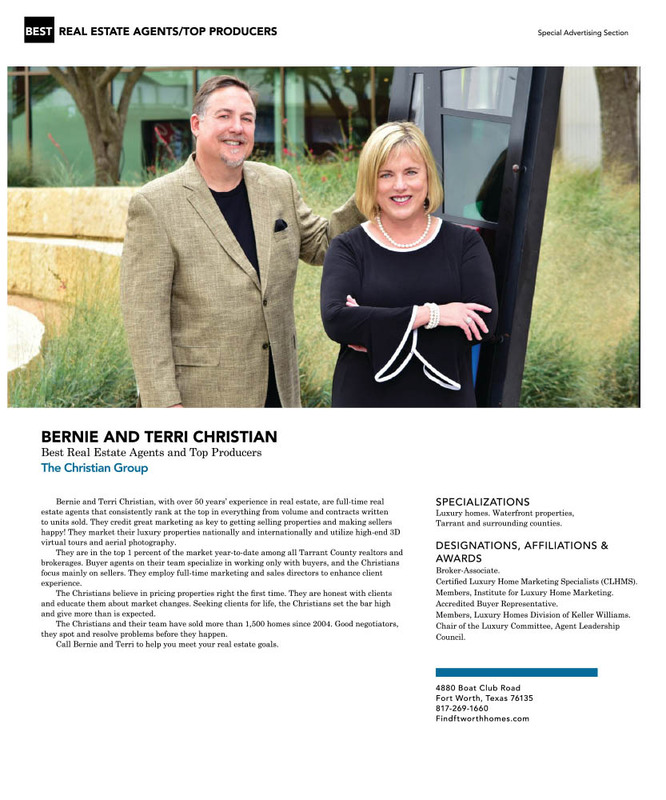 Bernie and Terri Christian, with over 50 years’ experience in real estate, are full-time real estate agents that consistently rank at the top in everything from volume and contracts written to units sold. They credit great marketing as key to getting selling properties and making sellers happy! They market their luxury properties nationally and internationally and utilize high-end 3D virtual tours and aerial photography. They are in the top 1 percent of the market year-to-date among all Tarrant County realtors and brokerages. Buyer agents on their team specialize in working only with buyers, and the Christians focus mainly on sellers. They employ full-time marketing and sales directors to enhance client experience. The Christians believe in pricing properties right the first time. They are honest with clients and educate them about market changes. Seeking clients for life, the Christians set the bar high and give more than is expected. The Christians and their team have sold more than 1,500 homes since 2004. Good negotiators, they spot and resolve problems before they happen. Call Bernie and Terri to help you meet your real estate goals. Luxury homes. Waterfront properties, Tarrant and surrounding counties. Certified Luxury Home Marketing Specialists (CLHMS). Members, Institute for Luxury Home Marketing. Members, Luxury Homes Division of Keller Williams. Chair of the Luxury Committee, Agent Leadership Council.